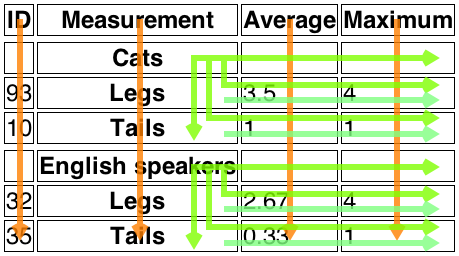 Authors and implementers are encouraged to consider using some of the table design techniques described below to make tables easier to navigate for users. In all of the following attribute and method definitions, when an element is to be table-created, that means to create an element given the table element's node document, the given local name, and the HTML namespace. The createCaption() method must return the first caption element child of the table element, if any; otherwise a new caption element must be table-created, inserted as the first node of the table element, and then returned. The createTHead() method must return the first thead element child of the table element, if any; otherwise a new thead element must be table-created and inserted immediately before the first element in the table element that is neither a caption element nor a colgroup element, if any, or at the end of the table if there are no such elements, and then that new element must be returned. The tFoot IDL attribute must return, on getting, the first tfoot element child of the table element, if any, or null otherwise. On setting, if the new value is null or a tfoot element, the first tfoot element child of the table element, if any, must be removed, and the new value, if not null, must be inserted at the end of the table. If the new value is neither null nor a tfoot element, then a "HierarchyRequestError" DOMException must be thrown instead. The createTFoot() method must return the first tfoot element child of the table element, if any; otherwise a new tfoot element must be table-created and inserted at the end of the table, and then that new element must be returned. The createTBody() method must table-create a new tbody element, insert it immediately after the last tbody element child in the table element, if any, or at the end of the table element if the table element has no tbody element children, and then must return the new tbody element. The method must throw an "IndexSizeError" DOMException. The method must table-create a tbody element, then table-create a tr element, then append the tr element to the tbody element, then append the tbody element to the table element, and finally return the tr element. The method must table-create a tr element, append it to the last tbody element in the table, and return the tr element. The method must table-create a tr element, and append it to the parent of the last tr element in the rows collection. Then, the newly created tr element must be returned. The method must table-create a tr element, insert it immediately before the indexth tr element in the rows collection, in the same parent, and finally must return the newly created tr element. If index is less than −1 or greater than or equal to the number of elements in the rows collection, then throw an "IndexSizeError" DOMException. If index is −1, then remove the last element in the rows collection from its parent, or do nothing if the rows collection is empty. Otherwise, remove the indexth element in the rows collection from its parent. span IDL属性は、同じ名前のコンテンツ属性を反映しなければならない。It is clamped to the range [1, 1000], and its default value is 1. Uses HTMLTableColElement, as defined for colgroup elements. The rows attribute must return an HTMLCollection rooted at this element, whose filter matches only tr elements that are children of this element. If index is less than −1 or greater than the number of elements in the rows collection, throw an "IndexSizeError" DOMException. Let table row be the result of creating an element given this element's node document, tr, and the HTML namespace. If index is −1 or equal to the number of items in the rows collection, then append table row to this element. Otherwise, insert table row as a child of this element, immediately before the indexth tr element in the rows collection. If index is −1, then remove the last element in the rows collection from this element, or do nothing if the rows collection is empty. Otherwise, remove the indexth element in the rows collection from this element. The rowIndex attribute must, if this element has a parent table element, or a parent tbody, thead, or tfoot element and a grandparent table element, return the index of this tr element in that table element's rows collection. If there is no such table element, then the attribute must return −1. The sectionRowIndex attribute must, if this element has a parent table, tbody, thead, or tfoot element, return the index of the tr element in the parent element's rows collection (for tables, that's HTMLTableElement's rows collection; for table sections, that's HTMLTableSectionElement's rows collection). If there is no such parent element, then the attribute must return −1. The cells attribute must return an HTMLCollection rooted at this tr element, whose filter matches only td and th elements that are children of the tr element. If index is less than −1 or greater than the number of elements in the cells collection, then throw an "IndexSizeError" DOMException. Let table cell be the result of creating an element given this tr element's node document, td, and the HTML namespace. If index is equal to −1 or equal to the number of items in cells collection, then append table cell to this tr element. Otherwise, insert table cell as a child of this tr element, immediately before the indexth td or th element in the cells collection. If index is less than −1 or greater than or equal to the number of elements in the cells collection, then throw an "IndexSizeError" DOMException. If index is −1, then remove the last element in the cells collection from its parent, or do nothing if the cells collection is empty. Otherwise, remove the indexth element in the cells collection from its parent. Uses HTMLTableCellElement, as defined for td elements. colSpan IDL属性は、colspanコンテンツ属性を反映しなければならない。It is clamped to the range [1, 1000], and its default value is 1.
rowSpan IDL属性は、rowspanコンテンツ属性を反映しなければならない。It is clamped to the range [0, 65534], and its default value is 1. 要素が親tr要素を持つ場合、cellIndex IDL属性は、親要素のcellsコレクションにおけるセルの要素のインデックスを返さなければならない。If there is no such parent element, then the attribute must return −1. A row is a complete set of slots from x=0 to x=xwidth-1, for a particular value of y. Rows usually correspond to tr elements, though a row group can have some implied rows at the end in some cases involving cells spanning multiple rows. A column is a complete set of slots from y=0 to y=yheight-1, for a particular value of x. Columns can correspond to col elements. In the absence of col elements, columns are implied. If the table element has no children elements, then return the table (which will be empty). If span is greater than 1000, let it be 1000 instead. Let all the last columns in the table from x=xstart to x=xwidth-1 form a new column group, anchored at the slot (xstart, 0), with width xwidth-xstart, corresponding to the colgroup element. Let the last span columns in the table form a new column group, anchored at the slot (xwidth-span, 0), with width span, corresponding to the colgroup element. End: For each tfoot element in the list of pending tfoot elements, in tree order, run the algorithm for processing row groups. If yheight > ystart, then let all the last rows in the table from y=ystart to y=yheight-1 form a new row group, anchored at the slot with coordinate (0, ystart), with height yheight-ystart, corresponding to the element being processed. If colspan is greater than 1000, let it be 1000 instead. If rowspan is greater than 65534, let it be 65534 instead. If xwidth < xcurrent+colspan, then let xwidth be xcurrent+colspan. If yheight < ycurrent+rowspan, then let yheight be ycurrent+rowspan. Let the slots with coordinates (x, y) such that xcurrent ≤ x < xcurrent+colspan and ycurrent ≤ y < ycurrent+rowspan be covered by a new cell c, anchored at (xcurrent, ycurrent), which has width colspan and height rowspan, corresponding to the current cell element. Take the value of the principal cell's headers attribute and split it on ASCII whitespace, letting id list be the list of tokens obtained. For each value of y from principaly to principaly+principalheight-1, run the internal algorithm for scanning and assigning header cells, with the principal cell, the header list, the initial coordinate (principalx,y), and the increments Δx=−1 and Δy=0. For each value of x from principalx to principalx+principalwidth-1, run the internal algorithm for scanning and assigning header cells, with the principal cell, the header list, the initial coordinate (x,principaly), and the increments Δx=0 and Δy=−1. If the principal cell is anchored in a row group, then add all header cells that are row group headers and are anchored in the same row group with an x-coordinate less than or equal to principalx+principalwidth-1 and a y-coordinate less than or equal to principaly+principalheight-1 to header list. If the principal cell is anchored in a column group, then add all header cells that are column group headers and are anchored in the same column group with an x-coordinate less than or equal to principalx+principalwidth-1 and a y-coordinate less than or equal to principaly+principalheight-1 to header list. If either x or y are less than 0, then abort this internal algorithm. Specification values: Steel, Castings, Ann. A.S.T.M. A27-16, Class B;* P max. 0.06; S max. 0.05. Per cent elong. 50.8 mm or 2 in.